Bad luck Tony Gibson. Despite the black ops campaign Slater and Odgers seem to have run for PoA. Despite the mud slinging from far right Christian radio. Despite the anti-Union hysteria generated by the mainstream media. Despite Len Brown becoming a scab mayor. Despite the claims it was militant unionists when it was militant bosses. Despite the disgusting way a wharfie had the terminal illness of his wife revealed. Despite the murky behind the scenes machinations of Council Controlled Organisations picked by Rodney Hide for privatization purposes. Despite saying that there was no way the workers could gain back their jobs. Despite this entire farce being a manufactured crisis from day one. The employment court has for the second time slapped down the PoA bad faith bargaining campaign in a decision that would make even the most hysterical anti union yob pause mid spittle and admit the tactics to date have had nothing to do with productivity and everything to do with ideology. 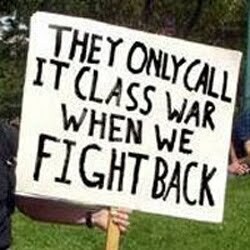 This war represents the attempt by big business to stamp the low wage economy all over workers faces, and there can be no fence sitting. If destroying working class job security and just terms of employment are really the future of NZ, then we have no future. It is time for this right wing joy ride to end, Tony Gibson is threatening the entire NZ economy by destroying the PoA, it is time he was arrested for crimes against the economy. Well the wharfies have got this far because they run an old school style union that understands the meaning of solidarity. Helen Kelly and the CTU may consider justice will be delivered by the courts but winning court battles isn't winning the war. If the wharfies win this as I suspect they may, it will be because they gave us all a contemprary demonstration of exactly what a real trade union does when confronted by intransigent weasely & pencil-necked greedheads. That would be a vital instruction for young New Zealanders, one could almost see the scales fall from their eyes as they absorbed rule number one; that a committed band of workers will beat a cowardly conglomeration of capital every time. It's been pretty obvious that part of PoA's strategy was to try and starve the wharfies into submission. That way they could pick the eye teeth outta their workforce and stuff em into contract labour. Ha! They just didn't reckon on the wharfies goin old school on their asses. Now the PoA is copping it from both sides. One side working kiwis who believe in a fair go AND the other side PoA executive's greedheaded mates who are becoming concerned that all this ideology might be impinging on their divine right to turn a quid. Assholes. There is still a long way to go; no doubt, but there is a glimpse of light down the tunnel for the wharfies and by extention all working kiwis.